Set against the current proliferation of global "difference" and economic realignment, Critical Dispositions explores the notions of "evidence" and "expertise" in times of material scarcity. Both have come to the forefront of national and international debate in education as "evidence" and "evidence-based" research and pedagogical practices continue as major trends in educational policy. 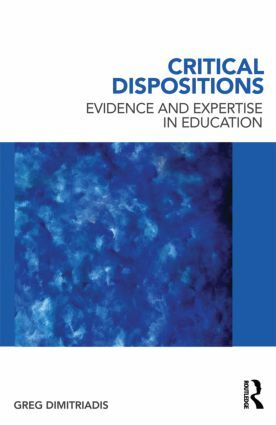 Author Greg Dimitriadis maintains this debate is best understood as part of a broader rise in professional and managerial discourses in various aspects of educational research and practice. Each aims to control and contain some aspect of research and practice in ways that are increasingly specific and targeted. As demonstrated through examples from critical intellectuals and artists outside the field of education, this current proliferation of specific, autonomous fields of inquiry and practice marks a much deeper ambivalence about our contemporary moment and how we understand it. Following Bourdieu and other theorists, Dimitriadis argues that educational researchers and practitioners today must be increasingly self-reflexive about the positions they take up in various fields of inquiry, what they allow us to see and to understand, what they blind us to. This kind of self-reflexivity, however, is becoming increasingly difficult today as material demands and dislocations are forcing educators to occupy particular fields in more specific ways. Unpacking this tension and offering alternative "thinking tools" is at the core of this volume.